Megaphase is leading the industry in the supply of a wide variety of high quality electrical and mechanical products at competitive prices. Whether you are an electrical engineer or contractor working within the industrial, commercial or domestic sectors, Megaphase is the one-stop shop for all your electrical and mechanical needs. Notably, our service includes dependable expert assistance from an extremely experienced and knowledgeable technical talent team. 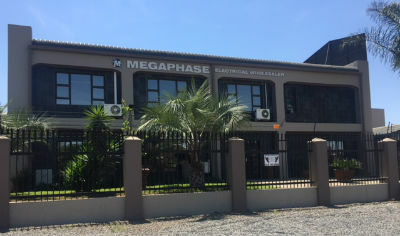 As a large wholesaler that values the development of strong and trust-based relationships with all our customers, Megaphase sets itself apart from other industry players by ensuring that our sizeable Pretoria warehouse is always fully stocked with reputable brands that meet the various electrical and mechanical requirements of our diverse clientele. This is to say that we go to great lengths to be fully informed about our customers’ evolving demands – including new technological developments and the latest regulations – thereby guaranteeing that our clientele need not look elsewhere for superior and cost-effective solutions. Megaphase not only sells electrical products, but is backed by years of electrical and engineering experience to ensure that your relationship with us is mutually beneficial. Simply put, we pride ourselves on our ability to meet all your needs, and always strive to achieve maximum customer satisfaction. From an initial no-obligations consultation to the quick and safe delivery of products to site, Megaphase has you covered. Having grown from strength to strength since our founding in 2000, our commitment to 100% customer satisfaction has seen our clientèle expand from areas all over South Africa into the international African market. Megaphase’s technical talent team has several decades’ worth of experience between them, which not only means that the advice we have to offer is sound and based on truly impressive collective knowledge, but also that our understanding of the industry’s electrical and mechanical requirements has been built over many years of practical experience. As we have interacted with numerous customers from a wide variety of backgrounds – each facing unique circumstances – Megaphase is fully enabled to provide you with all the products you need to get the job done. Whether you are working with high-voltages and amperages on a 3-phase supply, or a lower voltage single-phase circuit, our technical talent and sales teams can assist you in obtaining the best supplies at the best price. Our commitment is, and always been, to you – our valued customer. Please feel free to get in touch for enquiries, further information or quotes, or drop by our Pretoria warehouse at 336 Alwyn Street, Waltloo, for a friendly conversation.